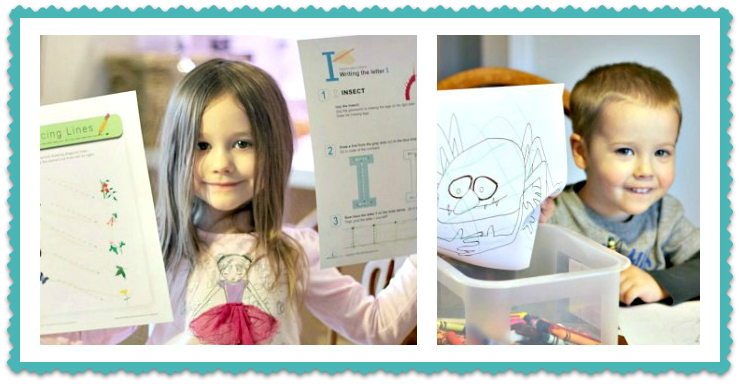 Fun Insect Craft for Your Preschooler! I suggest incorporating some workbook or color pages along with the craft, depending on the age of the child. I found bug color pages online at Coloring.ws and printed those for my 3 year old. Next I printed bug workbook pages from Education.com for my 5 year old. I also wanted to read some books to them about insects. I didn’t have any available and didn’t have enough time to purchase any, so I went to Amazon and purchased some for Kindle. I actually don’t have a Kindle, but I do have an IPad Mini and there is a Kindle app that lets you download and read books on your IPad. The app can be purchased through Amazon as well. I found three books for preschoolers about insects and purchased the kindle version. I started our insect project by reading the books to my little ones to spark their interest in insects. 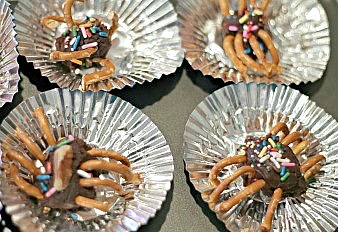 We then made our “Creepy Crawly Pretzel Snacks”. Make the ganache the night before. First, crush the chocolate chips in a blender or food processor. Next, heat the cream in a saucepan on low for about one minute, then turn it up to medium. Just when it begins to boil, pour the cream over the crushed chocolate and quickly stir with a chopstick until the chocolate melts. Chill overnight. To make insect legs, break round pieces off the pretzels and set aside. Pick through the nuts, choosing intact pieces to reserve. Before you start cooking, it’s a good idea to sit down with your child and take a look at an insect book. Look at pictures of spiders and bugs together and explain that spiders always have 8 legs and bugs have 6. Now it’s time to get sticky! Wash everyone’s hands then have your child scoop a small spoonful of ganache and use his/her fingertips to model a body while it’s on the spoon. Poke pretzel bits into the sides for legs and add a pecan on top for a carapace. Have him/her finish decorating his critter with candy sprinkles or dots. 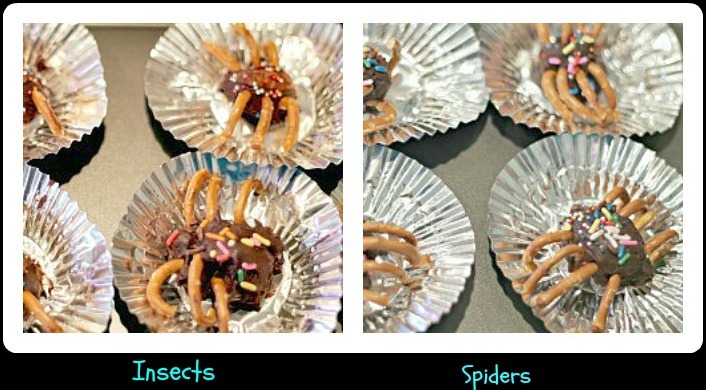 When they are all done decorating their insect, use the second spoon to push the critter onto a cupcake paper. Place the cupcake paper with the insect on the baking sheet. Complete all of your insects, placing them on the baking sheet and then place it in the fridge to chill. The kids loved making their bugs and also loved eating the ingredients. 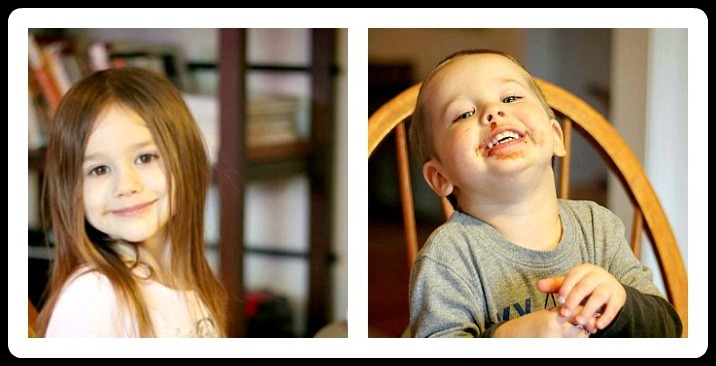 See the evidence on my little ones faces! After the bug snacks were completed and placed in the fridge we did our workbook and color pages. Every part of the insect project turned out to be a hit with the kids. At the end of the day, they took a plate full of their special snack home with them to share with their mom and dad And last, but not least, the workbook and color pages are displayed with pride!